The Republic of Namibia is a vast, sparsely populated country situated along the south Atlantic coast of Africa between 17 and 29 degrees south of the Equator. With its surface area of 824 268 square kilometres, Namibia is the 31st largest country in the world. It stretches for about 1300 km from south to north, and varies from 480 to 930 km in width from west to east. Namibia (previously known as South West Africa) is bordered by South Africa in the south, Angola and Zambia in the north, and Botswana and Zimbabwe in the east. The oldest desert in the world, the Namib Desert, stretches along the whole west coast of the country, while the Kalahari Desert runs along its south-eastern border with Botswana. Namibia's economy is heavily dependent on the extraction and processing of minerals for export. Although the mining sector employs only about 3% of the population, mining accounts for 20% of GDP. Rich alluvial diamond deposits make Namibia a primary source for gem-quality diamonds. Namibia is the fourth-largest exporter of non-fuel minerals in Africa, the world's fifth-largest producer of uranium, and the producer of large quantities of lead, zinc, tin, silver, and tungsten. According to David Bristow's article in the December 1994 issue of Getaway magazine: "When it comes to seaside resorts it's hard to beat Swakopmund, the holiday centre of Namibia: that's because it has the largest beach in the world. Its sandy sea front stretches, almost unbroken, from the Orange to the Kunene River Mouth - an incredible 1 500 kilometres. The beach varies between about 50 to 100 kilometres wide, prompting many people to call it a desert. It is, according to scientists, the oldest, and rivals Chile's Atacama Desert coastline as the most arid place on earth. Others call it a sand sea, which is understandable in a country that has only one permanent water course between its northerly, and southerly riverine borders." Swakopmund, Namibia's second biggest town and traditional "summer capital", is one of the most surreal places in this surreal country. The town is approached through the endless expanse of the Namib Desert, one of the world's largest wilderness areas. Then, through the mists (it is almost always misty in the morning and late afternoon), Bavarian spires and elaborate Germanic architecture rise through the fog banks. The boom of the surf on the notorious Skeleton Coast is an ever-present reminder of the icy Atlantic Ocean beyond. The town is an eclectic mixture of Bohemian and Bavarian, home to an intriguing mix of artists, hippies, strait-laced descendants of German settlers, stately Herero women in Victorian dress, and hard-bitten miners, game rangers, safari operators and fishermen. Swakopmund exudes romance and history, a rich cultural melting pot of old and new. 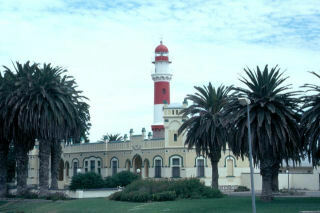 The coastal town of Swakopmund is Namibia's premier resort. Its most splendid facility is undoubtedly The Swakopmund Hotel & Entertainment Centre: a 4-star luxury hotel, built in and around the impeccably restored old station building. The Swakopmund Hotel attractions include an entertainment centre with two cinemas, a casino, a video arcade with the latest games, speciality shopping, fast food, and an action bar with live entertainment and dancing. Wireless Internet access is available in the foyer of the hotel.